The Planet Saturn - rules over Capricorn and Aquarius, exalted in Libra, rules over Saturday. 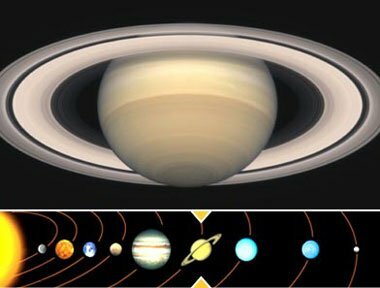 The Planet Saturn - The Ringed Planet, is the 6th planet from the Sun and the second largest in our solar system. Saturn is regarded by many as the most beautiful of planets. Astrologically Saturn is referred to as the sower and the reaper. Saturn is the planet of restriction, boundaries, limitations, hard work, responsibility, practicality and reality, self doubt and depression. At times Saturn is know as the God of Duty and will punish those who do not work hard enough. The Ringed Planet governs a persons career, ambition, hierarchy, authority, discipline and a persons sense of duty. The return of Saturn in to your Zodiac sign is said to mark important events in a persons life. Saturn takes 30 years to transit through all signs of the Zodiac. In Roman mythology Saturn is the god of agriculture, and the glyph or symbol for Saturn is often seen as scythe-like, and is known as the crescent below the cross. Those with Saturn in Aries take on a lot more responsibility and they struggle harder, more so than others. They can easily become frustrated with having to make the effort to assert themselves. Anger may be an issue for most and lack of self confidence. As far as risk taking, it goes from one extreme to another, some unwilling to take a chance, becoming lethargic to making rash, foolish decisions with their lives. They fear failure and rejection. They can be shy and withdrawn and afraid to ask for what they want from others. They can be controlling but are also very reasonable and amicable towards others. They have very high levels of concentration in most tasks they partake in. They need to balance what is most important in their lives and what is trivial and ignore it. Those with Saturn in Taurus have the need for stability and security in their lives. They work hard and play hard to get what they want. They are cautious and patient towards others and as friends, they make reliable and trustworthy companions. They take their time when making decisions and then it is either all or nothing. They can come across as possessive, but this is because they are scared of losing what they have. They can be stubborn, once they make their minds up, nothing and nobody will change their views. They view everything in black and white. They are highly disciplined and will stop at nothing until they reach their goal in life. Those with Saturn in Gemini are adaptable and can deal with most changes. They are highly imaginative and always thinking up new ideas. They also have the tendency to take themselves and others around them a little too seriously. They have good organization skills and have the ability to pick out the smallest details, however minor. They can have a problem with doubting their own abilities and they fear rejection. They possess good writing skills however can be poor communicators when speaking in public. They can be prone to nervousness which can lead to tension and even depression at times. They despise anything or anyone that appears superficial and dislike inane, mindless small talk. They prefer to see everything around them as logical and as real as possible. Those with Saturn in Cancer have the strong need for emotional security. Though they have the tendency to hide their own feelings and emotions they value family and loved ones above all else. They are prone to depression and need constant reassurance that they are needed by others. They often dwell on past mistakes and will cling onto anything that makes them feel more confident and in control. Sometimes they will keep others at a distance as a way of self protection. However they also possess more courage than most to over come their fears and become stronger as time goes by. Those with Saturn in Leo are born leaders and they thrive on it. They strive for recognition in everything they do. They have high expectations of themselves and of other people. They also appear cold and reserved towards others. They dislike showing their emotions and will often put up a wall as a way of protecting their own fears. They despise being the centre of attention and open communication is sometimes a problem for them. They are, at times, over cautious which can create problems in different aspects of their life. However they possess strong willpower and are also highly disciplined and will usually be successful in their lives. Those with Saturn in Virgo are hard working, practical and serious. They like things to be predictable and are always planning for the future. They are perfectionists but can easily become distracted by trivial matters. They can be critical even towards themselves. They can be shy and withdrawn, they detest any attention which is drawn to them. They prefer everything to be in order and in its proper place. They thrive when they are in a controlled and routine environment. Those with Saturn in Libra strongly believe in justice. They are intellectuals. They are tactful and diplomatic towards others. They can sometimes suffer from lack of self confidence and will avoid taking any big risks for fear of rejection. They are extremely patient and will take their time weighing up the pros and cons before making a final decision. They have a high level of endurance and flexible enough to adapt to anyone else's needs. They have a deep empathy for others and will give help when it is needed. Those with Saturn in Scorpio are hard working and demanding. They can also be impatient but determined when it comes to achieving their goals. They have high expectations from other people as well as themselves. They are full of energy and vitality. They fear rejection and hate feeling inadequate in any way. They can be extremely unforgiving if they feel someone has done them injustice. They can be resentful and jealous at times. They are cunningly clever when it comes to business deals. If they feel inferior to something or someone they may try to over compensate in other areas of their life. They can be secretive and hide their true intentions. They are very passionate in what they believe in to the point of intensity. Those with Saturn in Sagittarius are highly intellectual. They have very strong morals and principles. They prefer the logical way of thinking. They are always seeking further knowledge. They crave adventure and excitement in their lives and thrive on constant change. They dislike being in a controlled, rigid environment, preferring to have the freedom to come and go as they please. They are honest and open minded when communicating with others. Those with Saturn in Capricorn are highly ambitious. They crave power and are best at working alone at their own pace. They easily become frustrated if others cannot reach their own high standards. They are highly motivated and disciplined. They strive on being recognised for their own achievements. They prefer to work and play by the rules. They much prefer to be in control rather than being controlled by someone else. However they always take the time to help those that really need it. They have the gift of the gab and make great public speakers. Those with Saturn in Aquarius are loyal and strong minded. They are creative and like to be original in their way of thinking. They are fond of organizing and thrive on helping others to achieve their goals. They can be loners but they enjoy being amongst large groups of people. They like to appear level headed towards others and can fear showing their true feelings though this can sometimes lead to them ending up frustrated and jaded. They can come across as impersonal and opinionated to others. They can become resentful of criticism that is directed at them. They have the ability to make a valuable contribution once they open up and show how unique their own ideas are. Those with Saturn in Pisces are very sensitive individuals. They can feel helpless and if paranoid may even feel they are constantly victimised. They need to learn to be more positive in their way of thinking. However they are deeply compassionate and loyal towards those they care for. They will always put other peoples needs before their own. They thrive on security and a strong stable base on which they can achieve their dreams. They sometimes, have trouble letting go of past hurts and will become despondent if they allow themselves to dwell on them. They have a high level of endurance and are actually a lot stronger than they think.